Social Media trends are rampant and it’s difficult to decipher which ones you should be taking seriously and which ones you can say “oh that’s nice” and walk away from. 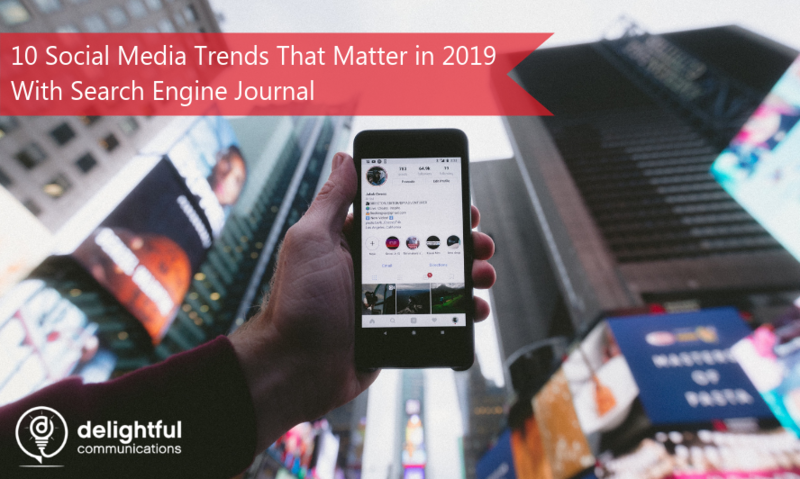 Luckily, 30 of the top experts on social media chimed in with Search Engine Journal to identify 10 important social media trends that will matter most to marketers, brands, and businesses in 2019. Delightful’s fearless leader, Founder, and CEO, Mel Carson, was a key contributor. Joining the ranks of amazing industry experts including Akvile DeFazio and Ashley Ward, who Mel delivered a webinar with SEMRush with just before the holidays. The experts touch on everything from audience engagement and authentic storytelling to the power of influencers and employee advocacy programs. There is a plethora of actionable, useful, and relevant content gathered all in one place. In the article, Mel says that brands will need to work harder to capture and retain the trust of their target audience in 2019. People, not just pixels means a lot to us here at Delightful, as it’s one of our core principles. More than just talk about the importance of people, we put them at the heart of everything we do. Whether it be in our work or growing as a team, people come first. Interested in a deep dive into how you can be more successful at social media marketing? Download Search Engine Journal’s free eBook, 30 Experts on the 2019 Social Media Trends That Really Matter. You guessed it, Mel chimes in there too, so be sure to check out the eBook for even more tips and insight into the world and trends for 2019. Thanks to Search Engine Journal for picking Mel’s Delightful brain and putting together such a complete and insightful take on the social media trends shaping the present day and the future of digital marketing.